1. Qualify for the 31st Senior PGA Professional Championship presented by Cadillac (October 3-6 at Omni Barton Creek Resort & Spa in Austin, Texas). You will need to enter through the PGA of America by calling Membership Services at 800-474-2776 or online at https://pgatournaments.com. The Section Championship entry form closes on August 21. The National Qualifier must be entered through the PGA of America no later than August 21 at 11:59 PM. The top five qualifiers from the PNW Senior PGA Professional Championship presented by Cadillac will advance directly to the 2019 Senior PGA Professional Championship presented by Cadillac. The event will be played October 3-6 at Omni Barton Creek Resort & Spa in Austin, Texas. The Pacific Northwest Section PGA Professional Championship presented by Cadillac is only open to Senior PGA Members of the Section. For complete eligibility information see form supplied by the PGA of America. 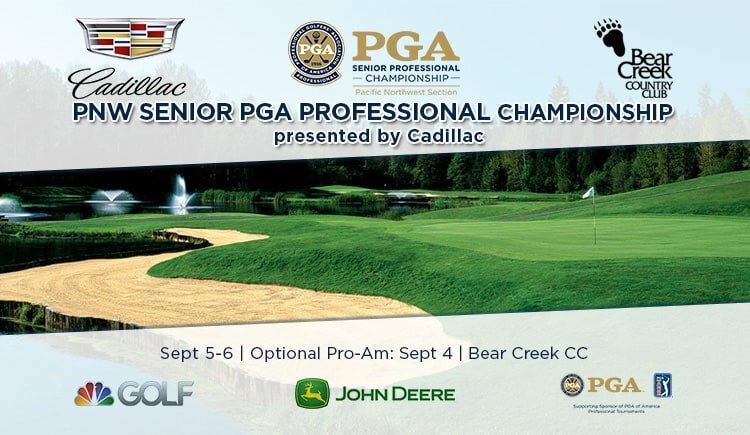 The top five qualifiers from the PNW Senior PGA Professional Championship presented by Cadillac will advance directly to the 31st Senior PGA Professional Championship presented by Cadillac, to be played October 3-6 at Omni Barton Creek Resort & Spa in Austin, Texas. Additionally, top finishers at the 31st Senior PGA Professional Championship presented by Cadillac will earn a berth in the 81st KitchenAid Senior PGA Championship, to be conducted May 18 – 24, 2020 at Harbor Shores Course in Benton Harbor, Michigan. The Senior PGA Professional Championship was established in 1952. Some can remember way back in 1965 when Harry Umbinetti was the top money winner of the event taking home a whopping $250 dollars. Back then, the championship was held at the Yakima Elks’ G&CC with only 21 professionals battling it out for the mere sum of $920 dollars. The famous Bob Duden won the championship six times during the 70’s and seven times overall. Today this is a popular event for Section seniors. For complete list of PNW Senior PGA champions, visit the PNW PGA history project site.